One of these three invaders is an imposter. So, how can you tell which one is the Invader and which one’s are the imposters? Let’s look at the first of the three. On the left we have an invader (of the alien kind). 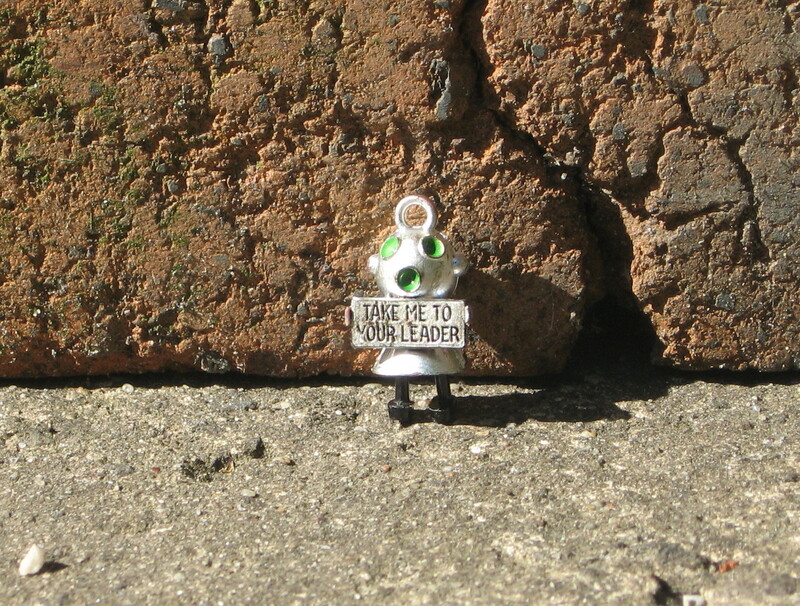 This invader is one of the traditional “Take Me To Your Leader” types we always thought would come down upon us from another planet – most likely a Martian invasion. Great fun value, but hardly life-threatening. I think this model may have actually come from a breakfast cereal box, or he may have dropped in from outer space. 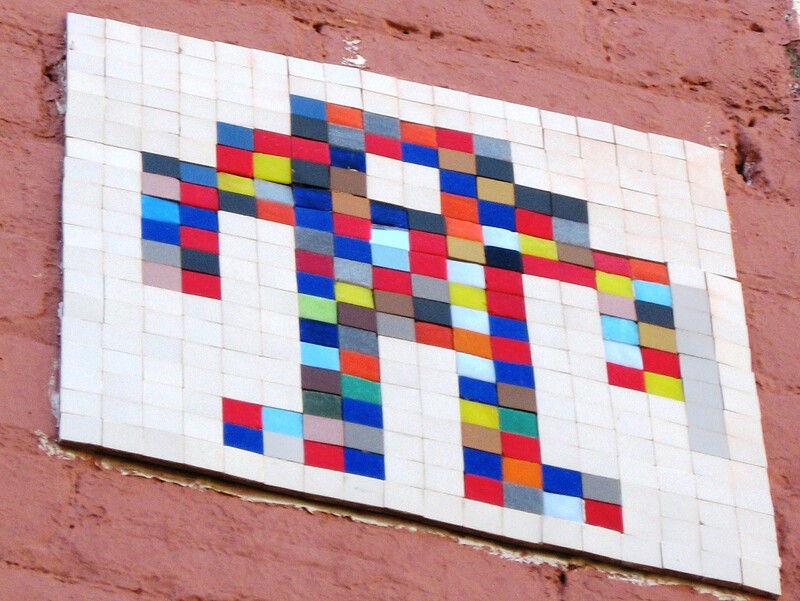 Second, we have a space invader by French street artist – Invader (born 1969) who is a French urban artist who pastes up characters from; and inspired by the 1978 arcade Space Invaders game, which is made up of small coloured square mosaic tiles that form a small robotic mural. Invader documents these “Invasions”, with books and maps of where to find each invader in various cities around the world, originating in Paris in 1998 Invader has spread throughout many cities in France, and through Europe, South America, USA, Canada, Asia, India, and Australia. Typically, the mosaics are located 10 to 15 feet above the ground, and often on street corners in areas of high visibility. 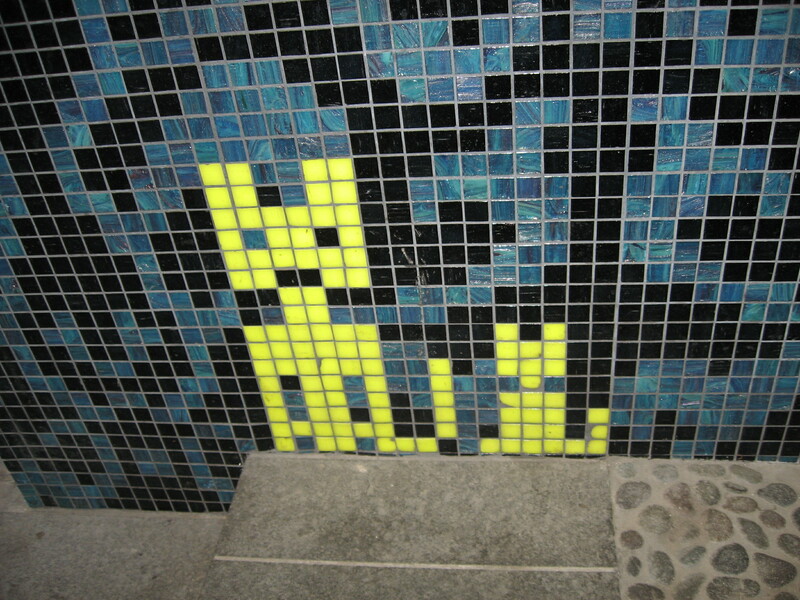 Lastly we have a possible Invader imposter which uses mosaics to create objects or pictures. This one is at ground level and seems to be related to a cafe. So, my tally for invader/imposters is two for mosaic art and none for alien art, even though only one mosaic art is an Invader. PS the non-mosaic alien invader is good, but not as good as Marvin the Martian. Anyone agree? This entry was posted in Ceramics, Mosaics, QuestionableArt, StreetArt, StreetArtists and tagged #UrbanArt, Invader, Invader the street artist, Space Invaders, StreetArt, urban artist. Bookmark the permalink.